schooled | No, YOU Tell It! 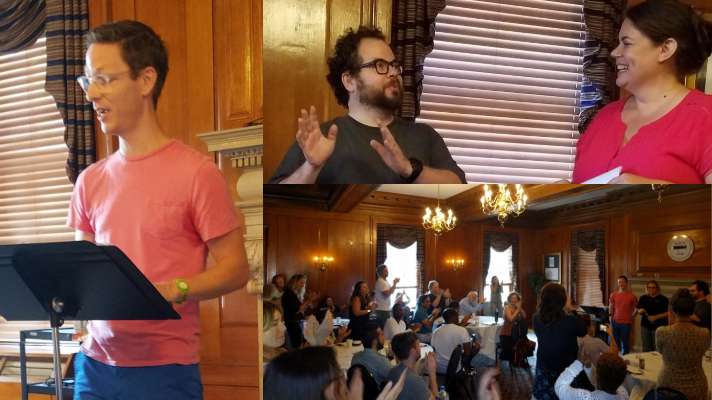 The tri-flip was directed by our own Kelly Jean Fitzsimmons and we couldn’t be happier by the ecstatic reception from FDU students, alums, and faculty in attendance. Podcast of the live show coming soon. SUBSCRIBE today! Click here to see more pictures from the show. Learn more about our switched-up “Schooled” storytellers below! Left: Eliot Schrefer, Top: Andrew Condouris, Kelly Jean Fitzsimmons, Bottom: Lovely FDU applause! ANDREW CONDOURIS has been writing since he was eight years old. One night, the stars in the sky mixed up with the city lights, and he wrote a little poem about it. Since that night, he has always been inspired by shadows and the strange beasts he finds there. ELIOT SCHREFER is a New York Times-bestselling author and has twice been a finalist for the National Book Award. In naming him an Editor’s Choice, the New York Times has called his work “dazzling… big-hearted.” He is also the author of two novels for adults and four other novels for children and young adults. His books have been named to the NPR “best of the year” list, the ALA best fiction list for young adults, and the Chicago Public Library’s “Best of the Best.” His work has also been selected to the Amelia Bloomer List, recognizing best feminist books for young readers, and he has been a finalist for the Walden Award and won the Green Earth Book Award and Sigurd Olson Nature Writing Award. He lives in New York City, where he reviews books for USAToday. Visit www.eliotschrefer.com UPCOMING: His next novel, Orphaned, comes out 9/25!! 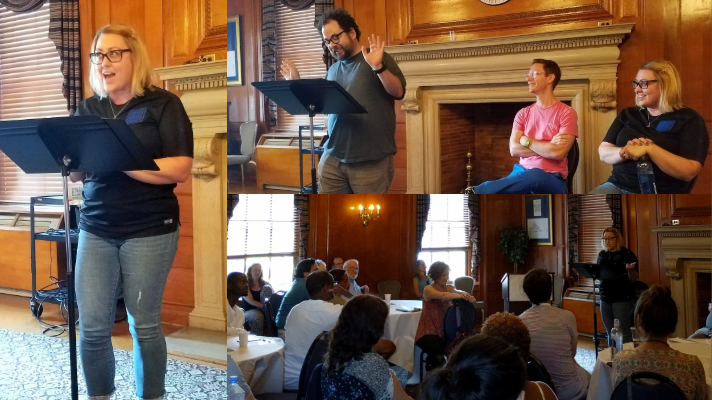 Our own Kelly Jean is thrilled to be back at Fairleigh Dickinson’s summer writing residency working with faculty, students, and alums of FDU’s MFA in Creative Writing program. No, YOU Tell It! “Schooled” is this Sunday, August 5th, featuring “switched-up” storytellers: Andrew Condouris, Eliot Schrefer, and Tiffany L. Berryman. SPECIAL SHOUT OUT to FDU and NYTI alum & friend, Timmy Waldron, who has a new short-story collection. Learn more about Stories for People Who Watch TV at https://www.newmeridianarts.com/stories-for-people-who-watch-tv and click here to grab a copy! 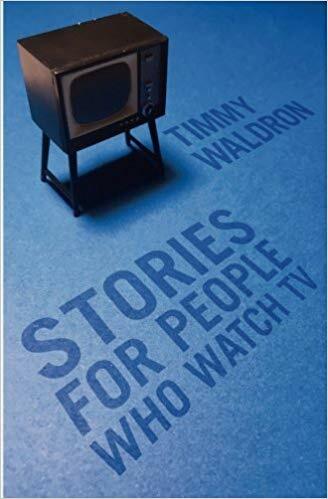 In Stories for People Who Watch TV, from start to finish, Timmy Waldron deals deftly with the characters of his generation: the mischief they get up to, their jobs, their coworkers, their new suits, the bars, their parents, their husbands and wives, their dependence on technology and the credit-card grifters, the physical and spiritual fights with one another and themselves. Waldron’s fictional portrait – as befits a master craftsman – is so impeccable one begins to fear that it is real, and maybe it is – regardless, the reader will continue breathlessly turning pages. Stories for People Who Watch TV is not to be missed. Waldron is a writer who delivers! Want to HEAR some of Timmy’s work today? Click here listen to him switch up his story in Episode 2 of our podcast.